Last view: 37 days ago I've just discovered this forum, and it looks exciting - especially as it's having a reverse-engineering section! My current impression was that the 3DS rev-engineering scene didn't exist yet (or that it was hiding in chatrooms). Now that a 3DS-dev forum exists, I really wonder what will happen in future! As by now, I am only having a DSi console (no 3DS yet), and I am mostly interested in low level hardware stuff (not higher level 3DS operating system stuff, although, if the low level hardware isn't accessible, then one would probably need to deal with the OS). Concerning DSi hardware: Is it allowed to post DSi stuff on 4dsdev? Asking because there isn't any DSi-dev forum yet, and understanding the DSi hardware would certainly help understanding the 3DS hardware. So I am hoping that DSi reverse-engineering might be welcome, too? If yes, maybe adding some sentence "forum dedicated for 3DS and DSi" on the mainpage would do it (such a sentence might be nice anyways, since the current headline doesn't even mention the 3DS yet). For a sepatate DSi section, that might be nice, too. On the other hand, many of the 3DS and DSi stuff is overlapping, for example, I wouldn't know where to ask questions about 3DS-vs-DSi compatibility... is that a 3DS topic or a DSi topic? PS. there a few people interested in a DSi forum, see http://gbatemp.net/threads/nintendo-dsi-section.393580/ - the gbatemp admins don't seem to like the idea though, and a "dev" forum would be better than a "consumer" forum like gbatemp anyways. Last view: 37 days ago Just wondering how far homebrew Wifi is possible on different consoles yet. Last view: 37 days ago I've dumped the ROM from the AR6002G-AC1B chip. It's 80Kbytes (as specified in the datasheet), located at 8E0000h (as indicated by the vectors in RAM). The "MM-DD-YY" date format doesn't look too intuitive. Something like "DD Month YYYY" would be clearer. At the moment one could only guess which of the two-digit values is day or month or year. Colors/fonts are hard to read in some cases. Especially headlines with gray/white/magenta text.. drawn on light-blue background? That's making the user names (and link/edit/quote buttons) almost inlegible. At normal viewing distance (about 40 centimeters) it's looking as if all board members are called "oooo", "dolo", and "ooooob". If I climb on the table, then I can decipher the text (from about 20 centimeters distance). Using a darker background color than light-blue should fix it; best combined with brighter text colors than gray or magenta. I am using some old Opera version (which normally works well with other forums). Last view: 37 days ago I've reverse engineered the DSi's SD/MMC/SDIO I/O ports a while ago, see http://gbatemp.net/threads/dsi-reverse-engineering-sd-mmc-sdio-registers.395787/ for details. Most of the results are summarized here: http://dsibrew.org/wiki/SD/MMC/SDIO_Registers (and will be also included in next gbatek version). Most of the regular bits (those used by existing DSi software) should be known now - except for some bits in 40048F6h/4004AF6h, and (somewhat SDIO related) bits in 4004836h/4004A36h, 4004838h/4004A38h. Going by 3DS source code, the 3DS should be using exactly the same registers (but located at a different base address, ie. not at 4004800h-4004BFFh). If you have some working SD/MMC/SDIO engine, it should be easy to add the above fixed-verification stuff in there - best call the verifications in different places (eg. before, during, and after transfers) and throw some warning when encountering unexpected values. For example, the 3DS might have different chip ID in some register, and/or extra functions in other registers. Last view: 37 days ago On the DSi, the BPTWL chip (I2C device 4Ah) is used for LED/Volume/Powerbutton/Reset control. On the 3DS the chip is called somewhat different, but it should have the device number and same functions (plus some extra functions). Somebody told me that 3DS people have found a firmware for that chip, is that true? If it's patch-able and stored permanently in FLASH, then it might be useful for forcing the "warmboot" flag to be always set (which would theoretically allow to bypass the annoying health safety message). Last view: 37 days ago Thanks for fixing the code/code issue, I thought that one would have been most difficult. Edit profile? Ah, yes, that works (I've formerly only viewed my user profile, which showed the same settings, but didn't allow to change them). Okay, changed time/date to my preferred format. The theme already looked identical as in your screenshot, except that my browser did have a slightly smaller font... I've changed the font size from "82" to "100", and the user names are now looking about exactly as your screenshot. But the user names are still hard to read. Especially if the names have darker colors (like nocash or dela or plutoo) (the ones with brighter colors like StapleButter are easier to read). Part of the problem is that magenta isn't having good contrast against the blue background, and the black outlines drawn around the dark magenta text are making things even worse (eg. an "o" is looking like a blurred solid-filled circle, without any hole in the middle of the "o"; and most other lowercase letters like "a", "e", "s" are looking the same). It does of course depend on your eyes, monitor resolution, and font size - but the overall effect should apply under all circumstances: the user names are much harder to read than normal text (which is still legible at greater distances). Only thing that is even harder to read is the "Acmlmboard" style, with lightblue user names on white background :- ) but I prefer dark themes anyways. Last view: 37 days ago Yes, change colors! Making all user names white with black outlines should do it (and same for Link/Quote/Edit/Delete buttons). Making the lightblue background a bit darker would be also nice. Or if there's some meaning behind different user name colors, use very bright pastelized colors (something near white, with only some slight color tones). For the font size, "90" seems to look best for me. But that might depend on my browser & browser settings. Last view: 37 days ago Thanks, very nice to see how those ports look like for real on 3DS. Yes, they are looking as on DSi, even with the same fixed 3Fh, 2Ah values. Bit9 DSi7: SDIO card 1 async ;? Bit11 DSi7: SDIO card 2 async ;? Bit8 is for SD/MMC controller. Bit10 is for SDIO controller. But Bit9 and Bit11 are what? I have tried GNDing the "IRQ" pin on the SD slot, but that didn't trigger Bit9 (nor any other bit of Bit8..11). Also tried that with all variable bits in SD/MMC registers set and cleared (except SOFT_RESET of course), but didn't seem to enable the external IRQ pin either. Did anybody ever see the IRQ pins used/working? I wanted to start by the basics and determine how the DSP memory is mapped, and what is what on the DSP side. The DSP can only address 65536 words without switching banks or something in the like. That is, 128K. Assuming the two data RAM regions map to X-RAM and Y-RAM, and the program RAM goes from 1FF00000 to 1FF1FFFF, what would be in the leftover space? DSP-side I/O? Well uh, clearly this DSP is able to address more than 128K of memory. There has to be a way to select which chunk of memory is being accessed, like on the SNES where they have DBR and PBR to specify which banks the CPU will access. The docs mention movp and movd instructions, moving from/to data/program RAM. But nothing precises if the regular mov instructions access program RAM or data RAM. The DSi uses "MBK" registers http://problemkaputt.de/gbatek.htm#dsinewsharedwramforarm7arm9dsp for mapping WRAM either to DSP or ARM memory at 3000000h-3FFFFFFh. I would assume that the 3DS has some similar "MBK" mapping mechanism (but mapping to 1FF00000h-1FF7FFFFh instead of 3000000h-3FFFFFFh). Or is there no such mapping stuff on 3DS, and the ARM can access the memory even when the DSP is running? Yes, Teaklite 1 did support on 16bit addresses. And the (undocumented) Teaklite 2 seems to have been expanded to at least 18bit addresses. The 16bit br/call/bkrep opcodes are using two formerly unused bits to gain 18bit range (except bkrep with imm8, which is still restricted to 16bit). Don't know if/how call+ret are managing 18bit return addresses though. Mov opcodes must be in fact use some extra "bank" register. Maybe set via the new "load imm2,movpd" opcode, the "PD" might stand for "DataPage" or so. There are some new "movp" ocodes, allowing to use "(Ax)" (instead of 16bit "(Axl)") for program memory addressing, so there would be no "ProgramPage" required in that case. They could be used for manipulating program code (probably rarely done), or loading constants from program memory (might be done more often, but loading constants from data ram would be ways faster). For the DSi, I have found some teak code in a file called "aac.a" (inside of the NITRO filesystem of the DSi Sound utility). It seems to using COFF format, containing binary and symbolic labels, which would very useful for debugging. Are there any read-for-use utilities for extracting symbols from COFF files? 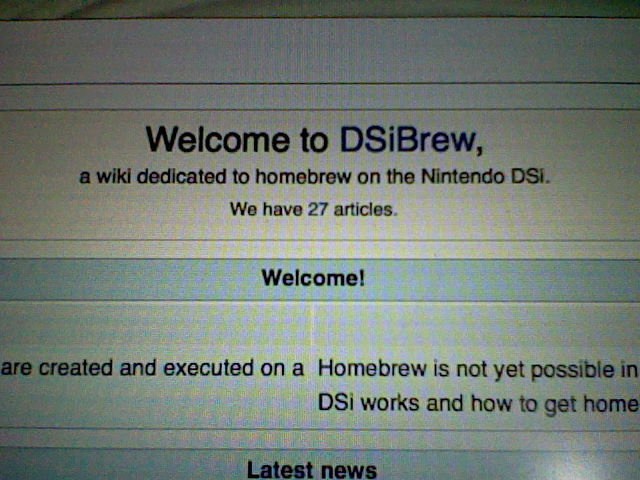 Last view: 37 days ago One of the obscurities in the DSi world is that we know that the DSi supports a "banner.sav". But we don't know what that banner.sav is good for, what kind of fileformat it might have, or if that feature was ever used by any existing DSi games. The only reference is at http://dsibrew.org/wiki/DSi_Cartridge_Header - does anybody know more about it? 1) Does somebody have some source code example for decrypting the RSA signatures in DSi cart headers? I guess any open source RSA implementations could do that, when calling the correct functions with correct parameters. 2) The DSi BIOS has two different subfunctions for RSA decryption functions (either one of them used, depending on bit0 of the first byte of the RSA key). Is that something common in RSA world? And what is it good for? Are that two different RSA variants, or is just some kind of optimization for faster processing of "even/odd" keys? 3) The DSi's encrypted RSA data is always 80h bytes in size. But the size of the decrypted output is variable (from what I've seen, it's always (?) 7Fh bytes; whereas those 7Fh bytes are usually mainly consisting of padding bytes). What is that variable length good for? Are there cases where it could be bigger or smaller than 7Fh? And is it something that can be freely assigned at encryption time, or is it just some "dirt effect" where the compressor is "randomly" assigning different lengths depending on the input? Last view: 37 days ago Thanks, good to know! Did anybody already dump that banner file from eMMC? Or know which exact Brain Age express title(s) are using it (or if any other games use it, too)? Anyways, great to know that the feature was ever used, and where to start searching. Last view: 37 days ago Does anybody know how to decompress the DSi's "\sys\TWLFontTable.dat" file? The only problem is that the font seems to be somehow compressed - it looks like some LZ compression variant, but I couldn't even figure out where the uncompressed header ends, and where the compressed font starts. Last view: 37 days ago Did anybody ever dump the chip IDs for the DSi/3DS cameras? And, apart from device 78h/7Ah, the DSi firmware is also supporting device A0h/E0h - which seem to be alternate cameras from whatever unknown manufacturer. Did anybody ever see a DSi or 3DS with device A0h/E0h installed? Last view: 37 days ago The DSi Camera utility stores some Exif header with AES signature in JPEG files, and refuses to load any JPEGs without such signatures from SD card. The 3DS is probably having same/similar JPEG signatures. Seeing a 3DS jpeg would be nice too. Can somebody upload such a file somewhere, or did anybody already do so? Does the 3DS contain the "DSi Camera" utility, too? If so, seeing a JPEG taken on "a 3DS in DSi mode" would be interesting, too. with both ARM7 and ARM9 envolved; which isn't too easy to disassemble. If you want to experiment with it, mind that the DSi uses little-endian AES (unlike most open source AES implementations), and observe that the official AES specs seem to require a 'header' (containing the extra data length with some weird encoding) in the first "extra associated data" block, but the DSi hardware does simply omit that weird header. Last view: 37 days ago The DSi has a bunch of RSA, AES, Blowfish keys in ROM. The only two ways for dumping that keys would be decapping the Main CPU, or using a main memory hack for dumping RAM copies of that keys during booting - which is both nothing that could be done easily at home. However, http://3dbrew.org/wiki/Memory_layout#ARM9_ITCM says that the DSi keys can be also found on 3DS at ARM9 ITCM address 01FFD000h or 07FFD000h. Is it difficult to dump that memory area? And does anybody know more about which DSi key is stored at which 3DS address? The DSi seems to have some extra keys that are missing in 3DS - but the DSi doesn't seem to use those extra keys keys either (maybe they are used only for DSi-debug version or so). Last view: 37 days ago Yes, the two round dots on the package seem to be somewhat common for Renesas chips. There're also two snippets from a decapped "BP_TWL-2" chip shown at https://chipworks.secure.force.com/catalog/ProductDetails?sku=NIN-BP_TWL-2 with text "NEC Electronics Corp. 2009, 33A" and "67". Whereas, NEC appears to have been sold to Renesas, so both manufacturer names are probably correct. Maybe the instruction set is described in some older NEC datasheets. at least, it should be so in DSi mode; maybe the 3DS uses other register indices when running in 3DS mode...? MySQL - queries: 21, rows: 96/96, time: 0.011 seconds.